Do you like to carry a bag with an unusual or unique design? Then we think you’ll love the Triple Play handbag pattern. It’s like a handbag in two halves – and then with another zipper pocket between those creating 3 storage areas to help keep you organised. Store items safely and securely in this fun and functional handbag. This bag will hold everything you need! It includes 3 large storage areas, 2 pouches and 1 zippered area. You can create a unique kaleidoscope effect for the front of the bag, or opt for a 1-piece, more subdued front. 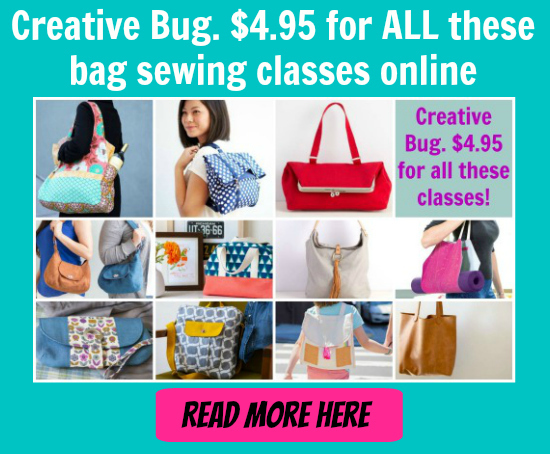 There are also a lot of options and room to embellish the top of the bag with ruched cording, pleated ruffles and more—or leave it clean and modern. There’s enough room for all your essentials: electronic devices, wallet, keys, makeup, books, craft items and more! Finished size is 13″W x 12″H x 6″D.